Turning my obsessions into your entertainment. Earlier this year Christina Aguilera returned to the music scene after an extended absence with the panned, ill-received ‘Bionic’. I personally had a list of unflattering comments about Aguilera’s recent musical direction including one about how she seemed to put aside her voice and talent to lazily rely on computers and autotune to carry her songs, that she just seemed vain and overall that I wasn’t sure what’d happened to the one time powerhouse singer. Well, she redeems herself with ‘Burlesque’. The soundtrack for the film is rather short and sweet but it packs a punch and leaves an impression. ‘Burlesque’ is all about a small-town girl with big dreams who moves to L.A. and ends up in a Pussycat Dolls-like cabaret/burlesque club that’s seen it’s better days and is run by Tess, played by Cher. The music can be described as soulful, a bit dated but satisfying nonetheless. Style wise, if you enjoyed Aguilera’s ‘Back to Basics’ era where she channeled the bygone era of music and didn’t rely on modern tricks of the trade like autotune but instead sang her behind off, you’ll like the ‘Burlesque’ soundtrack. 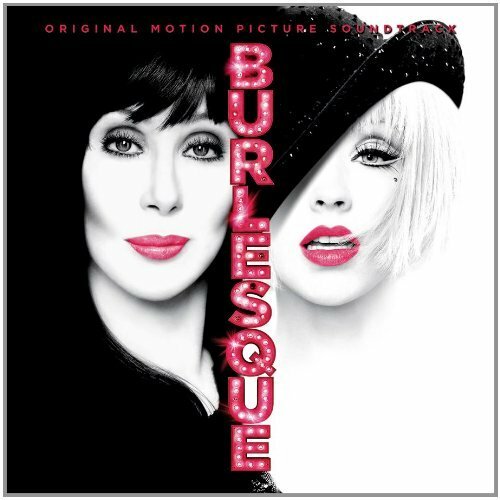 This feels like a Christina Aguilera album more so than a film soundtrack – sure, the movie’s tagline boasts that “it takes a legend (Cher) to make a star (Christina Aguilera)” but this album has just two musical appearances by the legend known as Cher. Slightly disappointing, but overall the movie’s music is worth listening to. “A Guy That Takes His Time” sounds a lot like “I Got Trouble” from Aguilera’s ‘Back to Basics’ album. As you can tell from the title, the lyrics are a bit suggestive but the beat and style are such a throwback to the jazz era of music that it makes the track one of Aguilera’s best performances on the album. “Express” is one of the more modern-sounding tracks. It starts off with trumpets and snapping but transitions into a beat that’s a bit electronic but what’s likable about this track is that unlike the past songs, this song had Aguilera singing in an aggressive, no-holds-barge manner. “You Haven’t Seen the Last of Me” is Cher’s moment to shine in the spotlight and I have to say, it’s the best track on the entire album. It’s this film’s very own “And I Am Telling You (I’m Not Going)” and Cher really belts out this ballad about facing obstacles and being determined to persevere. Listening to the lyrics you can’t help but to feel like this is more of a song about Cher than it is her character and that it was crafted just for her and I have to say – this song is Cher’s best in years and is absolutely breathtaking and exceeds all expectations. Too bad this is the last track and only 1 of 2 musical moments we have of the legendary Cher. “Show Me How You Burlesque” is a bit of a call-and-response track and big-band/swing in style. “A little bit of naughty is a little bit nice” Aguilera and her backup singers chant. “Bound to You” is Christina’s big ballad of the movie and after all of her throw-back tracks hitting on the different eras of music, it was nice to hear things slow down and hear Aguilera take on an emotional tear-jerker of a track. It’s similar to her recent ‘Bionic’ single “You Lost Me” but even better with how she seemed to put herself within the music and lyrics. It starts off a bit timid and gradually builds into a powerful, stirring track about how her character’s finally found a man she can trust and confide in. Though the other tracks of hers are catchy, this feels like her most authentic and genuine showing yet. The final track, “Beautiful People” is an upbeat, fun, pop song which kind of feels out of place style wise with the rest of the album but it’s a great track regardless. Considering this soundtrack features mostly songs by Christina Aguilera, it’s hard not to compare ‘Burlesque’ and its quality to Aguilera’s most recent album effort ‘Bionic’. Really, they are two completely different projects with ‘Burlesque’ being far superior. Here we have the Christina Aguilera we all love and like – fun, upbeat, pushing the envelope but overall, one who isn’t afraid of singing and isn’t relying on autotune and is just doing her own thing. I do have a few criticism, one of them mainly being Cher. How can you contract and nab such a big musical legend for a movie musical and only have her singing on two tracks, one of which feels quite forgettable musically? It seems like a big waste of her musical talent though I am sure she makes up for it with some of her acting and scenes. The only other thing I’d complain about is how the writers seemed to feel like the audience needed to be remembered what movie they were watching by working “burlesque” into as many songs and lyrics as they could. Still, it was nice to hear Aguilera actually singing and being the impressive performer we’ve known to her to be. It’s a short little album, clocking in under 40 minutes, but offers some great Aguilera musical moments and a nice new song from Cher. If you were a fan of Christina’s ‘Back to Basics’ album, ‘Burlesque’ is for you. If you weren’t, you’ll probably want to pass on this. “Like” The Man Crush Blog on Facebook! Antoine is a graphic designer and artist currently residing in North Carolina. He has a degree in Journalism and Mass Communication with a concentration in Visual Communication and specializes in graphic design and illustration. He has spent the past six years as a graphic artist for several publications based in North Carolina. He invites you to visit his design and social media blog at http://antoinereid.wordpress.com. Tyson Kobie – Tyson Kobie 4 U! Enter your email address to subscribe to The Man Crush Blog and receive notifications of new posts by email.